facts, figures, maps and more. 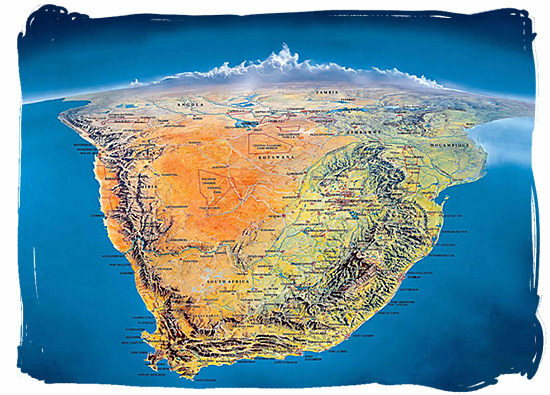 Learn more about the geography of South Africa with interesting data and information about the lay of the land. The basic outline is easy, in essence it consists of three main features, each one comprising a huge variety of scenery and natural resources. The main feature is an immense high plateau covering most of the country, encircled by the second feature, the coastal lowland regions. The third feature consists of a series of mountain ranges rising quite abruptly along the inland perimeter of the coastal lowlands, separating them from the high plateau. This last one is well-known as The Great Escarpment, with mountain heights ranging from 2,000 to 3.300 meters. The interior highlands of South Africa are part of the African plateau extending north right up to the Sahara desert regions. What is in a name?....one could ask. In South Africa the answer could be: "a rainbow". A rainbow of 11 different official languages and 7 different ways of saying "South Africa". Official name: "Republic of South Africa"
Noun and adjective: "South African(s)"
You will find South Africa at the southern tip of the African continent, stretching north to south for approximately 1,600 km (994 mi) between 22 and 35 degrees latitude, and east to west also for about 1,600 km (994 mi) between 17 and 33 degrees longitude. The Tropic of Capricorn slices through the extreme north of the country at 23 degrees 26’ 22” latitude. The interactive possibilities of the map below are quite stunning. Put the cursor of your mouse on any spot on the map you like to explore and follow the instructions underneath the map. The button in the right-hand top corner allows you to select a larger version of the map. The button in the left-hand top corner allows you to change from street map to satellite view and vice versa. The plus/minus button in the left-hand bottom corner allows you to zoom in and out. You can zoom in to a detailed street map of any city or area that you select. 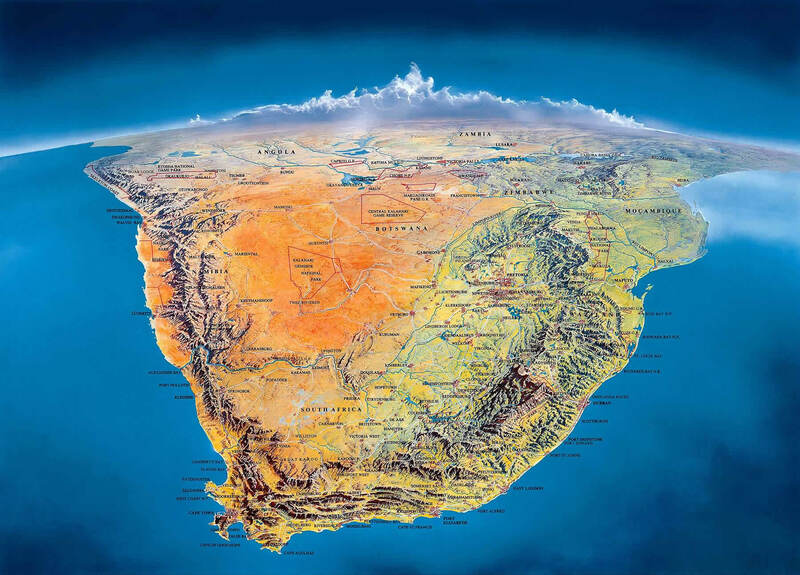 South Africa's entire land surface area comprises 1,219,090 sq km (460,693 sq mi), 40 percent of it lies 1210 m (3970 ft) above sea level with as highest point Mount Njesuthi in the Drakensberg mountains at 3,446 m (11,396 ft) above sea level. Included are the Marion and Prince Edward islands which became part of South Africa in 1947 and are situated in the Atlantic ocean 1,920 km (1,193 mi) south-east of cape Town. All together it makes South Africa the 26th largest country in the world. But to get a better idea, think in terms of the combined size of France, Italy, Germany, Holland and Belgium together or for our American visitors two times the size of the State of Texas. The population of the country based on the 2011 Census, comes to a total of 51,770,560 people, comprising the following ethnic groups: Black 79,2%, white 8,9%, coloured 8,9%, indian 2,5% and others 0,5%. For 2013 the population figure is estimated to become 52,981,991 people. The average population density based on the 2011 census figures is 42,4 per km2 or 109,8 per sq mile. 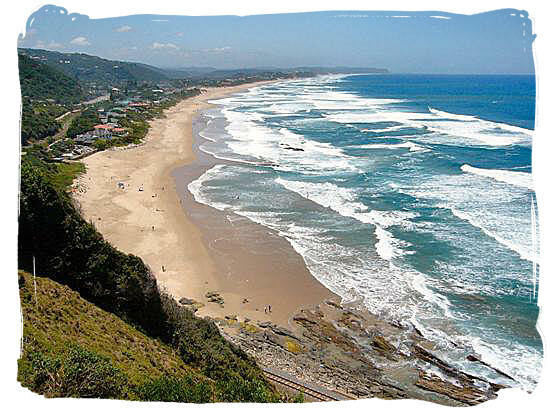 The total circumference of South Africa is approximately 6,320 km. Besides a coastline of 2,798 km (1,738 mi) with the Atlantic ocean to the west and the Indian ocean to the east, South Africa has common borders with the republics of Zimbabwe 225 km (139 mi), Mozambique 491 km (305 mi), Namibia 967 km (600 mi), Botswana 1,840 km (1,143 mi) and the kingdoms of Lesotho 909 km (564 mi), and Swaziland 430 km (267 mi). 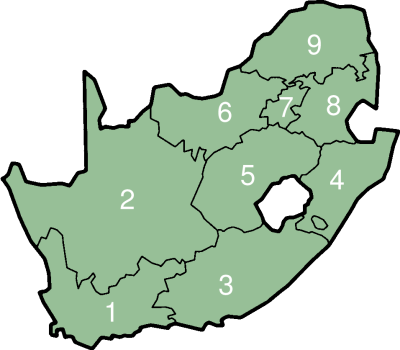 South Africa has nine provinces and three capitals. The provinces each with its provincial capital are, Gauteng - capital Johannesburg (7), Limpopo - capital Polokwane (9), Mpumalanga - capital Nelspruit (8), North-West province - capital Mmabatho (6), Free State - capital Bloemfontein (5), Eastern Cape - capital Bisho (3), Northern Cape - capital Kimberley (2), Western Cape - capital Cape Town (1) and Kwazulu-Natal - capital Pietermaritzburg (4). The numbers correspond with those on the map below. The national capitals are, Pretoria (administrative capital), Cape Town (legislative capital) and Bloemfontein (judicial capital). South Africa's coastline of 2,798 km (1,738 mi) features only a small number of bays and but one natural harbor, Saldanha Bay in the Western Cape. The other major ports, following the coastline clockwise are Richardsbay and Durban in Kwazulu-Natal, East London, Port Elizabeth and Mosselbay in the Eastern Cape and Cape Town in the Western cape. A total of 98 % of all South Africa's exports are conveyed by sea through these seven ports. The two most distinctive promontories on our country's coastline are the Cape peninsula, with the Cape of Good Hope at its southern tip and Cape Agulhas at the most southern tip of the African continent. 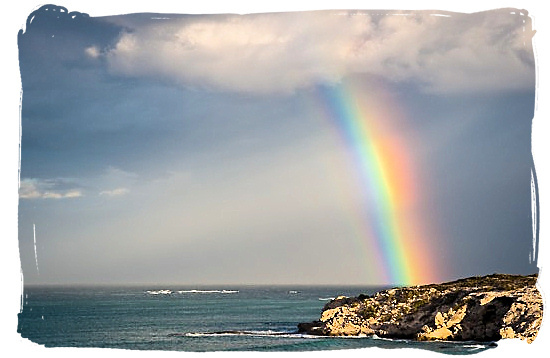 Cape Agulhas is the place where the two oceans, the Atlantic ocean and the Indian ocean, meet. The Orange, Vaal and Limpopo are the three main rivers in South Africa. The longest of the three is the Orange river, which has its source in the Kingdom of Lesotho where it is called the Senqu river. With its westernmost section forming the border with Namibia, it flows north-west for about 2,100km (1,300 mi) towards the Atlantic ocean. 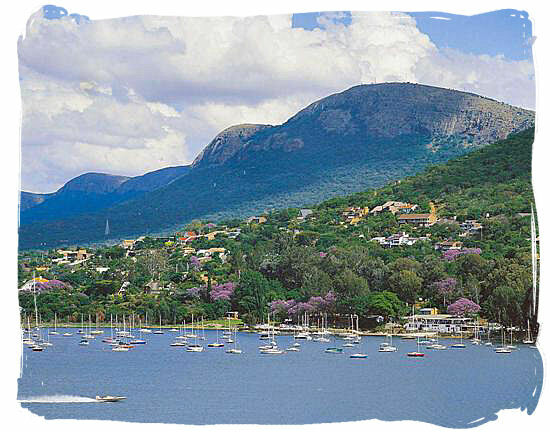 The Vaal river has its origin in the Drakensberg mountains in the Mpumalanga province. It is 1,120 km (695 mi) long and flows south west to where it unites with the Orange river of which it a tributary. 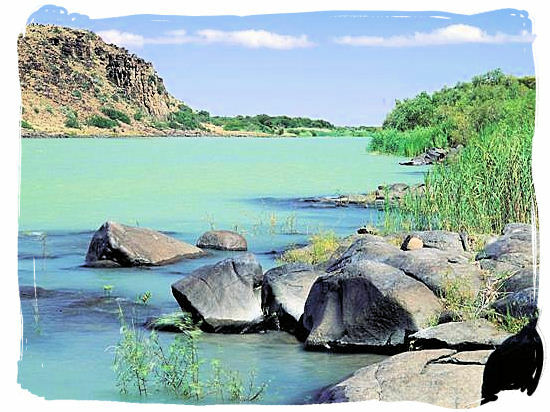 The Limpopo river rises in the Witwatersrand region, where it is called the Crocodile river. It flows in a circular route of about 1,700 km (1,056 mi), first to the Botswana border in the north east, where it turns east forming the border with Botswana and Zimbabwe to where it enters the country of Mozambique, finally emptying itself in the Indian ocean. The only natural lake to be found in South Africa is the Fundudzi Lake which is situated in the Soutpansberg mountains in the far north-east of the Limpopo province. Besides Fundudzi there are no true natural inland lakes of any significance in South Africa. Rivers are the main source of water. What you will find in our country are many large artificial lakes or dams for the storage of the country's water supplies. They are formed by constructing huge dam walls in the flow of rivers to regulate their natural variable flow and the transfer of water between catchment areas. There are 26 major dams in South Africa, ranging in capacity from the Gariep dam in the Free State at 5,341 million cubic metres, down to the Midmar dam in Kwazulu-natal at 175 million cubic meters.